As you arrive in the 'Golden City' of Jaisalmer, you will be met by the truly breathtaking sight of its sandcastle-like fortress, which really does evoke a feeling of the desert dream or even an actual mirage. Jaisalmer Fort itself comprises just less than 100 gigantic bastions, which encompass the narrow alleyways of the fort itself, which is still very much home to its own community of characterful houses, popular hotels, sumptuous temples, a magnificent palace, shops selling Rajasthani textiles, and local Indian restaurants, all of which have been constructed using golden sandstone. 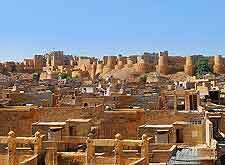 Jaisalmer has many exceptional qualities, and its remote location is just one of them, being surrounding by the barren Thar Desert and also some very important trade routes to Pakistan. Tourists will discover than much of the city has been shaped by its past Indian maharajas and wealthy merchants, and much of its past structure and appearance remains quite unchanged today. 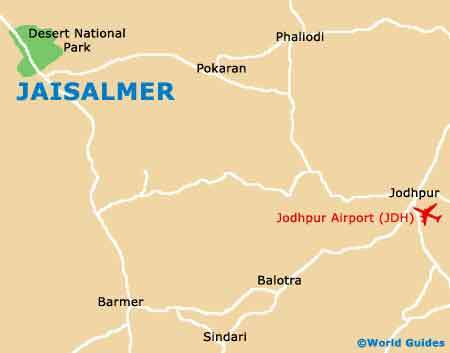 For tourism advice and similar information, the Jaisalmer Tourist Reception Centre is conveniently close to the fort, being located on the Gadi Sagar Road and to the south-east of the First Fort Gate. There really are endless good reasons why so many people choose to visit Jaisalmer each year. Tourists often enjoy boasting around the Gadi Sagar (Gadsisar Lake), which is surrounded by a number of beautiful temples, shrines and 'havelis' (grand Indian residences). However, it is the extremely popular camel safaris that Jaisalmer has become so very famous for. Camel rides take visitors on a very memorable ride into the desert, to stunning locations, such as the Sam Sand Dunes, with some packages including food and overnight camping, complete with a bonfire and views of the stars. 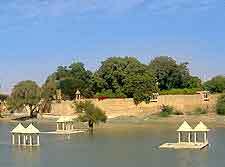 More information about Jaisalmer Tourist Attractions. Within Jaisalmer Fort, the seven interconnecting Jain temples really are not to be missed at any cost. As you step into the fortress itself, the Chandraprabhu Temple is the first of these structures that you will encounter and really sets the tone for your visit, boasting stunning traditional Indian architecture and an endless lacework of highly detailed stone carvings on its interior walls. The Parasnath Temple is also well known in Jaisalmer, boasting a grand gateway and an equally elaborate painted ceiling. More information about Jaisalmer Landmarks and Monuments. When it comes to museums, Jaisalmer does contains a small number, which are often of interest. The Desert Culture Centre and Museum is amongst the best and resides alongside the Gadi Sagar. Also nearby and very popular is the Folklore Museum, where there is a host of information relating to the rich Indian heritage of western Rajasthan, with displays including historical camel ornaments and even a number of old opium bottles. 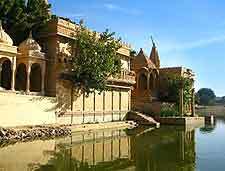 More information about Jaisalmer Museums. Finding your way around central Jaisalmer and its city walls is quite straightforward, as is reaching some of the neighbouring attractions outside of the city. Tourists should always consider day trips to the nearby Desert National Park, or to the rather unusual Akal Wood Fossil Park, which is brimming with Jurassic specimens of ancient sequoia trees. 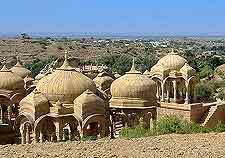 Also near to Jaisalmer is the fort and havelis of Bikanerm, the sand dunes of Khuri, the ruins of Lodhruva, and the local crafts works within Barmer, which make the perfect souvenir for a holiday memory. Further afield, the lakes of Udaipur may be of interest. More information about Jaisalmer Attractions Nearby.